I'm currently writing a paper about the history of shopping centers before the rise of the shopping mall (to complement the paper I wrote about history of shopping malls three years ago). 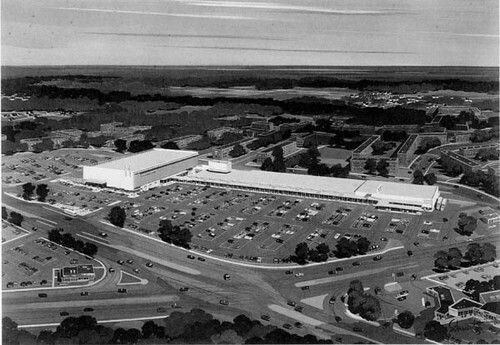 One of the major experts on this topic is George Washington University professor Richard Longstreth, who uses this drawing of a proposed shopping center in 1954 for his article "The Diffusion of the Community Shopping Center Concept During the Interwar Decades." Look familiar? That's the Langley Park Shopping Center, located at New Hampshire Avenue and University Boulevard, while on the drawing board. At the time, Langley Park was a new, if modest, neighborhood at what was still the edge of suburban Montgomery and Prince George's counties. The shopping center was designed by architects Abbott, Merkt & Company, then a nationally-renowned firm in the field of shopping center design. Cool to see this old photo. The big store on the left used to be a Landsburg's that my mom said she worked at around 1955. And a Giant Food was on the far right of the photo. She believes it then became a Klein's after Landsburg's. 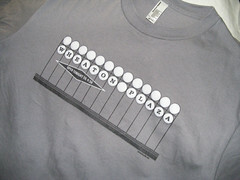 And I swear it was a KMart at some point when I was a kid in the 70's/80's, but I'm not positive. Regardless, that intersection is PACKED with traffic these days! Old drawing rather. Not photo. Cathy, you are right. The Klein's was turned into a KMart. After KMart left, Toys R Us moved from its original location in Lewisdale to the KMart building. There also was a famous restaurant named Eddie Lander's in this same shopping center along with a People's Drug Store.